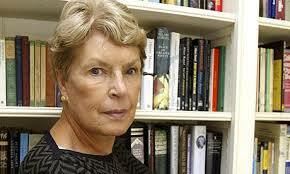 Rest in Peace, Ruth Rendell (1930-2015). I liked your work, particularly your Barbara Vine novels. I’ve heard them called psychological thrillers, and that’s true enough, I suppose. They didn’t quite seem literary fiction, perhaps because of how plot-driven they were, and how relatively unconcerned with style, but it’s more interesting to note that they nearly seemed like literary fiction, with their concern for character and the past. More significant than classification, they were gripping, they made me turn the pages, and not enough books do that. I wrote about you a little bit in my MA thesis, your contribution to the biographical quest novel. Your The Blood Doctor is as pure an example of the genre as A. S. Byatt’s Possession, as a biographer pierces the Victorian fog to get to the truth about his great-grandfather, a doctor obsessed with haemophilia. Asta’s Book and my favourite novel of yours, The Chimney Sweeper’s Boy, are also good examples of the genre. You kept depicting the past haunting the present, and you did it well.